Personal projects are super important for me. Having a personal project is like giving myself a homework assignment. I’m asking myself to do something I haven’t done before so I can learn from the experience of actually doing it (and not just reading about it). If I did nothing but take the same shots over and over eventually I’d be able to execute technically perfect shots quickly and without much thought. It’s a great way to become efficient and it’s important for creating a personal style. Personal projects are something else. They are the times I say to myself: “wouldn’t it be cool if I could do this” and I figure out how to make it happen. Thinking creatively and getting a unique shot is fun for me and for the people in front of my camera but not necessarily something I’ll end up selling. Those are the shots that help to define my style and they look spectacular in my portfolio. The creative shots are the ones that make me unique in a world filled with cameras and it also helps me to get new jobs. But it’s important to remember that paying customers have a specific idea that they are looking for. I need to deliver those shots first and they need to be perfect. On the day I shot Tom and Julie’s engagement pictures I spent a majority of my time getting shots that were pretty standard. Standard poses, standard lighting techniques and standard compositions. And all of the standard shots turned out great. This is super important since keeping the client happy is the most important part of being a professional photographer. When I know I have those standard shots I start thinking creatively. During the regular shots I’m learning about the people in front of my camera and I’m thinking about the best way for me to use the location to bring out their personality. For me, the creative location shots only come after the standard shots are on my memory card. For this shot it was only Tom and Julie in front of the camera and me behind the camera. I didn’t use a flash, I didn’t use collapsable reflectors and I didn’t use unique camera settings. To get this shot it was just a matter of finding a good looking location, positioning Tom and Julie until the light worked the best and then getting myself in the right spot to make the capture. This simple shot is one of the couples favorite shots from the day. With the regular shots done I asked Tom and Julie if they were interested in getting a “more creative” shot. I was thrilled when they agreed to try some new things and they even had a few ideas of their own. All of the ideas discussed included two bottles of wine that Tom used to propose to Julie. After we talked about the wine bottle shot I took on a leadership roll. This is super important since it’s the photographers job to know how to get the final look using only the gear brought to the location. The photographer needs to be able to put all the elements together that will become the final image. And the photographer should always know how best to pull the shot off. For our final shot of the night we wanted the wine bottles to be in the foreground with Tom and Julie dancing in the background. I wanted a shot that recreated the mood of the night Tom proposed to Julie. Now that I had the finished shot in my mind it was time to bring out the gear I’d need to make the shot happen. One big challenge for getting the shot was telling a story that included props (the wine bottles) but still had people prominently in the shot. I knew I wanted to lower the light level of the environment and use flashes to build up my scene. I envisioned a shot with the couple dancing together in the background with the wine bottles anchoring the shot. That meant I needed to get the wine bottles to be almost as big as the two people in the frame. Setting up the flashes was going to be easy for me. The tricky part of the shot was taking two wine bottles (at about a foot and a half tall) and making them as large as two full sized adults in the final image. My solution was to get a long lens and to force the perspective by having the wine bottles closer to the camera than the couple. This wasn’t difficult because we were outside and I had plenty of space. I started by putting the bottles on a quick product table I created with a posing stool and a black piece of foam board. With that done I used a flash to camera left with a softbox and an egg crate grid to see how things were looking. After a few test shots I changed the position of the light from camera left to camera right. The egg crate grid prevented this flash from affecting the light on Tom and Julie. I put a long lens on my camera and I composed a shot of the wine bottles. I knew that a longer lens (100mm or higher) could make things further away from the wine bottle look much closer (this is sometimes called lens compression). I went with a landscape orientation to leave room for the dancing couple to the side of the wine bottles and I moved myself back from the wine bottles until I was happy with how it looked with the long lens. Next I needed to position Tom and Julie in the frame. I had them stand about 20 feet behind the wine bottles. By placing them so far behind the wine bottles they looked much closer in size to the wine bottles (to the camera). This is something called forcing perspective (things further away from the camera look smaller than things closer to the camera look). Doing this also allowed me focus on the wine bottles and leave the couple just a little out of focus. This is important since a viewers eye goes to the brightest and sharpest part of an image first. My camera position was super low to make the shot work. I was pretty much sitting on the ground angling the camera up to create a straight line from the lens through the top of the wine bottles and ending with the top of Toms head. This camera positioning helped me to get exactly the shot I imagined. The camera was about 15 feet in front of the wine bottles and the couple ended up somewhere between 20 and 25 feet behind the wine bottles. My camera settings (f11 at 1/200 of a second using ISO 200) made the background look much darker than it was. To light Tom and Julie I boomed a three foot octa above the couple and I aimed it back just a little bit (to prevent the light from hitting my lens). This positioning let me get great looking light on both Tom and Julie because I wasn’t worried about lighting up the grass (which wasn’t going to be part of my final framing). For safety and stability I used about 50 pounds of sandbags on the light stand and I used a 15 pound sandbag as a counterweight for the boom arm. It’s still not perfect, but it’s much better with the additional flash than it is without it. The power setting for the flash was a bit high (which I didn’t notice on my cameras LCD) but I knew it didn’t need to be perfect because I planned to take the shot into Photoshop to remove some reflections. Any exposure issues could be quickly tamed while I was in Post-production. One last thing I added was some color to the shot with a blue gel (installed on the flash in the three foot octa-shaped softbox). Adding the colored gel gave the dancing couple some additional separation from the wine bottles and it darkened the couple just a bit to help direct the viewers eyes to the bottles first. 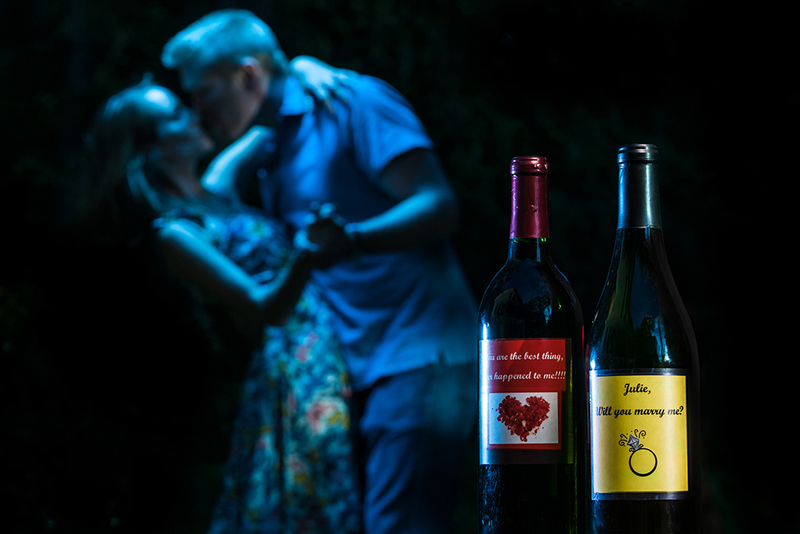 If you’re thinking that I could have photographed Tom and Julie on a black background and separately photographed the wine bottles on a black background to put everything together in Photoshop you’re right. It might have been easier but I wanted to try to get something for the couple to see while they were there with me. I needed to show them what it looked like to help them “get into character” during the shoot. When Tom and Julie saw some of the first frames I captured they understood what all the lights were doing and that really helped them get into the shot. I’m not sure the results would have been the same if I created a Photoshop composite. I’ve always said: “You should never, ever experiment photographically with a client” and this blog entry may seem like I’m contradicting myself. I assure you this is not experimenting. Getting a shot like this is about being creative after I have the standard stuff done. Sometimes your assignment may require a little creativity for the main shot. Being creative is all about having an idea and working with your subjects (people, pets, products or locations) to make the idea happen. I like to start simply and get creative after I have the full confidence of my subjects and sometimes I don’t have the time to gain that confidence. Every job is different but I still try to I take my subjects on a photographic journey whenever I can. You have to be confident with the creative shots so I think it’s important to practice being creative. This kind of photography is all about pushing myself (and sometimes pushing the people in front of my camera) to achieve something totally new and different. To get a creative shot I always begin by envisioning the final image and working to achieving that shot. When I’m on a location shoot I need to quickly evaluate the environment, decide on my background, setup my lights (or light control) and then work with my subject until the shot is captured. Thinking about getting creative shots, planning those shots and buying the gear to make it happen is a lot of fun for me and I really love the challenge of location work. It’s a rush for me to be in a new location with a lot of pressure to get a great shot. And as the jobs get bigger the challenges and the pressure continue to rise. It’s everything I love about being a photographer. I never would have embraced the unknown without giving myself lots of photography homework. The personal projects are what helped me become super comfortable when I’m working in places I’ve never seen before and that’s why trying new things and having personal projects is so important for me. This entry was posted in lighting how to, photography, photography how to and tagged behind the scenes, colored gels, engagement, lighting, location photography, photo shoot, portraits, wine bottle by Monico. Bookmark the permalink.